Before our kids were even born, my husband and I knew we wanted to raise our children with an awareness of global reality. Once they actually arrived, however, we found this easier said than done – especially when living in either isolated or wealthy communities. 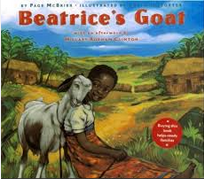 An early favorite was reading Beatrice’s Goat by Page McBrier, a true story about a girl in a village whose life changes all because of the gift of a single goat. There is a developing genre of children’s books telling stories of empowerment instead of pity that includes other titles like One Hen: How One Small Loan Made a Difference and The Good Garden: How One Family Went from Hunger to Having Enough. These books are all part of Citizen Kid, a book series designed to help children become better global citizens. Providing a glimpse into a positive view of diversity, Norah Dooley and Peter Thornton have written an absolutely fabulous series about a child who explores the world in her neighborhood by sampling the variations of foods they each enjoy. 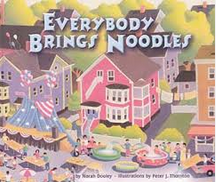 Titles include Everybody Cooks Rice, Everybody Bakes Bread, Everybody Brings Noodles and Everybody Serves Soup. My other all-time favorite storybooks that showcase the world are How to Make an Apple Pie and See the World and Abuela. Another genre of children’s books we’ve loved are illustrated non-fiction books about actual children around the world. 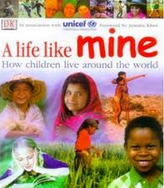 Our favorites include A life like mine: How children live around the world, Children just like me: A unique celebration of how children live around the world, If the World were a Village, and The Usborne Book of People of the World. 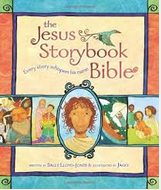 Having grown weary of too many depictions of a white Jesus loving on only white children, I’ve also been in search of children’s bibles that reflect the whole world God created. My favorite is The Jesus Storybook Bible, and World Vision also recently published God’s Love for You Bible Storybook. Videos can provide a more tangible reflection of global realities than books, and watching has helped our children get a better sense of how other children live around the world. Citizen Kid and World Vision both feature child-appropriate videos that explain concepts like the need for clean water, microenterprise and education. MamaHope also has an excellent series of short videos called “Stop the Pity” which portray those living in poverty with dignity and respect. Compassion International has a great site (that includes a downloadable study guide!) for kids to learn about poverty called Quest for Compassion. I’m also a fan of fun videos like Where the Hell is Matt which show the joy and humanity that span the globe. While much more challenging when our kids were younger, we’re now in a stage where we can actively participate as a family in service projects. We’ve helped serve meals for the homeless, visited nursing homes and participated in a service learning trip to Ecuador together. (While taking toddlers to another continent was certainly a challenge, it has been helpful to embed a personal connection to other realities in their minds.) I know other families who help at food pantries or tutoring programs. Serving helps children see beyond themselves, and I’ve been pleasantly surprised by how much my kids genuinely enjoy it. I’m also a thrift store fan and enjoy talking with my kids about how this kind of shopping serves more than just our own purposes. We eat at ethnic restaurants as frequently as possible, and have worked hard to help our kids learn about other cuisines. When we lived in an area where the closest thing to ethnic food was a Chinese/pizza buffet, I buckled down and learned a whole variety of Asian recipes to cook at home. As a result, we eat Sri Lankan food (check out my curry recipe here) at least twice a month and Asian food about half the time at home. While they still prefer pizza and chicken nuggets, they don’t scoff at Chinese food anymore and are willing to try a wide variety of foods. This wasn’t a simple process (there have been a lot of ‘eeewwws’), but our insistence to always try new food is starting to pay off. Here are some ethnic recipes to try with kids and some tips for introducing your kids to ethnic food. We’ve also made intentional efforts to help our kids experience a bigger world, whether it be exploring the town down the highway or crossing the globe to see family. Being an intercultural family, we wanted the world to be something that had always been a part of our children, not something new to which they would be suddenly introduced. While they don’t remember trips they made as babies, the family we visit remembers, and it has helped our kids develop a comfort with and attachment to another side of their background. 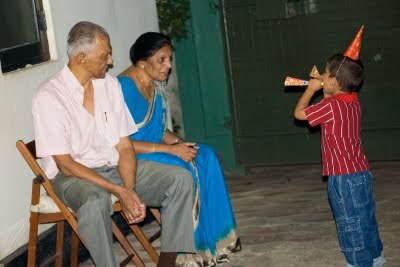 They’ve wrestled with uncles, played cricket with cousins, and kissed aunties. 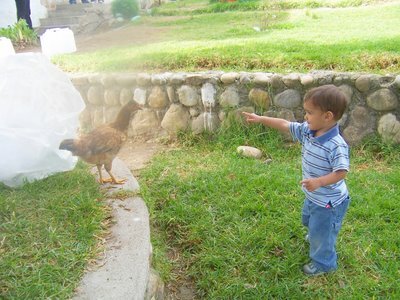 We also make it a point to visit lots of museums to help the kids can see worlds beyond their own. My favorite find is the Association of Science and Technology Centers Passport Program which allows free entrance to over 350 museums worldwide. We recently visited a science center in Kuala Lumpur on a layover for FREE! For those who travel around the US at all, it’s a quite economical way to visit a lot of different museums while only paying for membership to one. My introduction to the world began in part because my mom’s family hosted an exchange student from Thailand when she was in high school. We hosted another student from Finland when I was a teenager, and building a sisterhood across cultures proved to be one of the most cherished and foundational experiences of my life. We openly talk about giving with our kids, and two of the primary means we give are World Vision and Kiva. Both fund the empowerment of people living in poverty. I’ll often sit down with the kids and let them pick the microloans or projects we support. The World Vision site is great because it often includes videos that we can watch with the kids to help them understand just what it means to lack clean water or education. Watching these videos and then donating money to the projects have opened some great conversations. Because children naturally love to play and imagine, stories of other worlds like Narnia and Harry Potter have been helpful allegories in our house. Such stories help children begin to understand how other lands may have differing customs and realities than their own. The power dynamics between good and evil also help us explain the comple dynamics of world politics in more kid friendly ways. I am not naturally a simple person. I love shoes, ice cream, and soft beds. I like to shop and window browse and decorate. However, being married to a spouse from the developing world, I’ve had many occasions to grapple with what is necessity and what is luxury. Hence, I’ve spent a lot of time over the years sorting out my materialism, and looking for ways to simplify my life in light of how much of the world lives. It has in now way been a perfect journey (I still have a weak spot for shoes), but as it turns out, pretty much most things are luxury past food and shelter. As a result, we do the best we can to live within our means – no credit card debt, used furniture (my favorite chair has a big hole in the arm), simple schedules and intentional budgets. While we live in a small house and drive old cars, we often discuss with our kids how wealthy we are because we have these things at all, regardless of whether or not they are new. In turn, our imperfect efforts toward simplicity remind us to be grateful for the abundance we do possess, and enable us to give generously as well. What about you? What are ways you help your children learn about the world? This is a fantastic list! We have tried to incorporate many of these same strategies in raising our kiddos. They are still so young, though, so I look forward to future global awareness activities. 🙂 And thank you, thank you for introducing us to the Mama Hope videos. We’ve been enjoying those greatly today! Thanks, Sarah! Mama Hope is a favorite in our house as well!